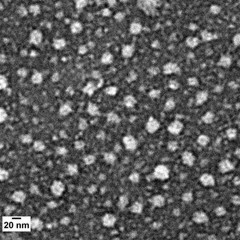 This transmission electron microscopy image shows nanoparticles made of a chemical called bis-MPA that are deposited on a carbon-coated copper grid. The nanoparticles are linked to a peptide antigen and a pH-sensitive dye by polyethelene glycol (PEG) linkers. These approximately 20-nanometer-sized particles display cancer antigens and target dendritic cells to trigger an immune response against cancer.